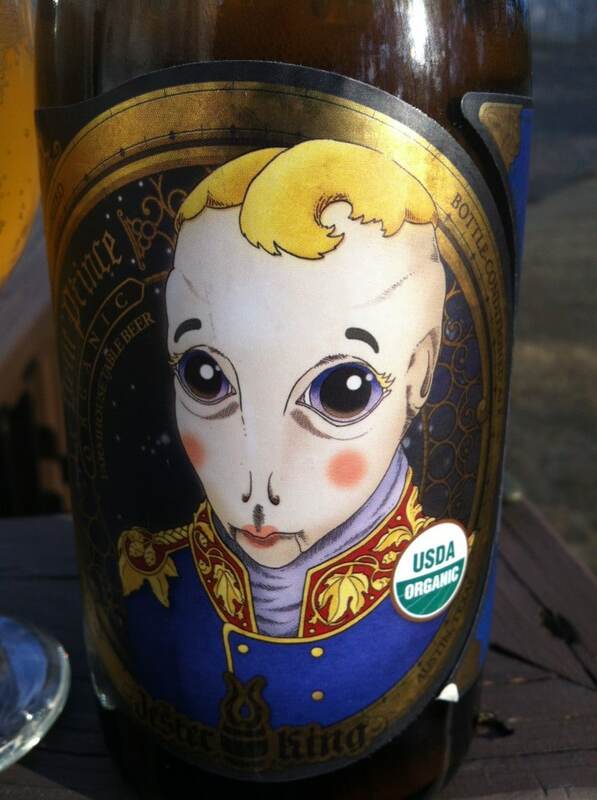 Big thanks go out to Lee for providing me with the original bottle of this back in 2012. That bottle was cracked open on vacation in Hilton Head, SC in summer of 2012. The height of relaxation for me these days. This review is a combination of two separate tastings, the second one being a bottle that I purchased from the Greenville Beer Exchange in Greenville, SC in March of 2013, about 9 months after my original notes. I paid $6.49 for the 750 mL bottle. Pour is a honey yellow with some lace but a scant and wispy head. Very well carbonated, lively and appropriate. Nose offers some clean malts and lemony hop profile. I think I’d stop short of lemongrass per se, but there is a slightly citric element in there that certain feels lemon based to me. We get a small burst of bitterness on the front end that dissipates very quickly. I wouldn’t call it ‘evaporating’ (since the EtOH would not allow that), but it moves on pretty rapidly. There’s a simple light grassiness about the beer that never adds up to funk, but certainly feels a touch organic in its presence. The lively carbonation backs off a touch in the middle and end, to reveal a smooth, fuller mouthfeel. 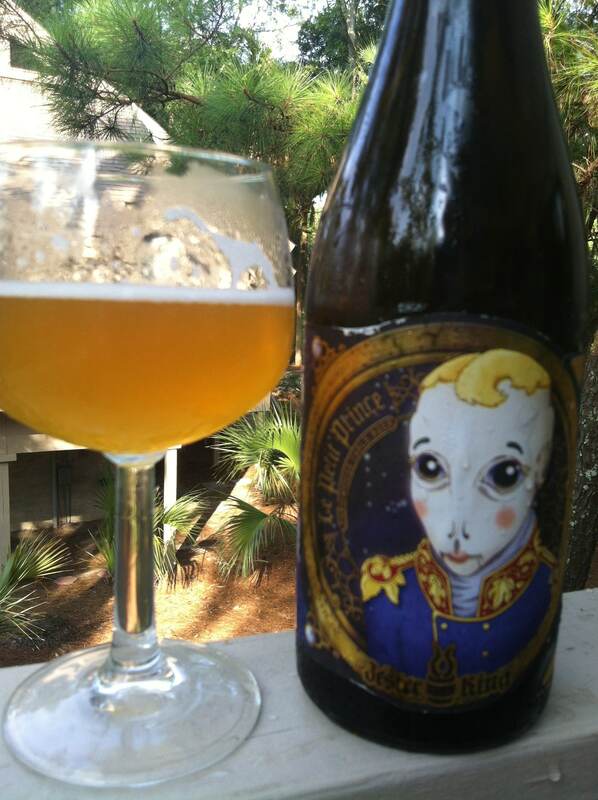 This and their ‘mild‘ are the beers that Jester King seems to be revered for, but with the greatest of respect, I think they are their weakest offerings. 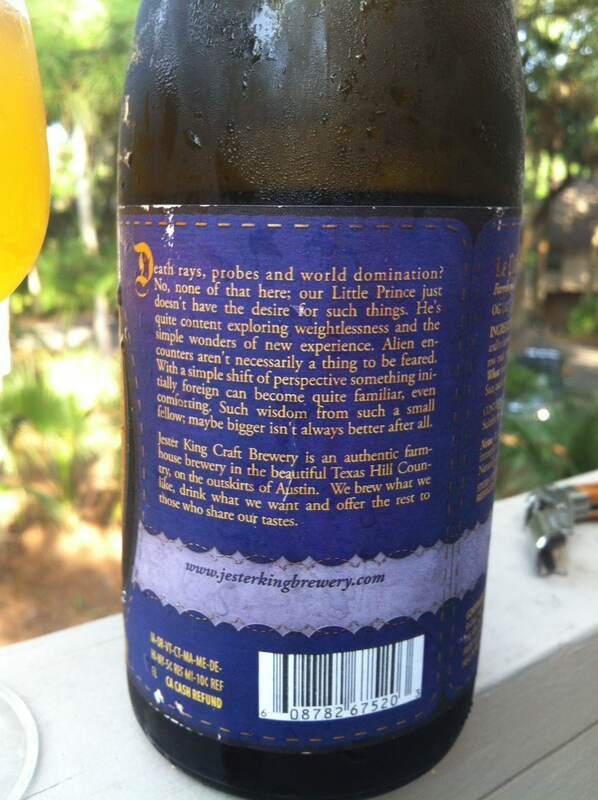 It takes a lot of skill to pull off beers of this ABV that are packed with flavor, and although I applaud the effort, Jester King is still a fair distance away from pulling it off for my money. Le Petit is not bad, but it has much to learn. I hope that JK continues to persevere, and in time this beer might grow up to be a big, flavorful beer with low ABV – maybe. Other: 2.9% ABV, O.G. 1.029 or 1025 depending on batch, F.G. 1.002, IBU 30, bottle-conditioned.